Model:619A (We provide the high-brightness version and free MINI HDMI cable). This liquid crystal display monitor employs new integrate circuits and high quality TFT LCD modules; it is putting out with its low power consumption, emits no radiation, and other advantage characteristics; this product is shaped with modern style and is easy to be carried with. The color TFT LCD is the most suitable display for VGA, VCD, DVD and GPS system for motorcars and ships, it also can be used in the office, in flat, at home also in other suitable position. You will certainly benefit from this monitor in lots of ways, to name some of them: convenience, safety, space-saving. Specifications: Panel size: 7 TFT LCD Resolution: 800 x 480 (support up to 1920 x 1080) Ratio Aspect: 16:9 Contrast Ratio: 500:1 Brightness: 450cd/m2 Viewing Angle: 140°/ 120°(H/V) Input signal: PC (VGA), AV, HDMI, DVI Audio speaker: 1(built-in) Current: 650mA Input Voltage: DC 12V Power Consumption: 8W Dimension(mm): 188L × 128W × 33H Weight: 486g. The monitor will work for all models of Camera! Package contents: 1 x LCD monitor(no touch screen) 1 x Remote control 1 x Hot shoe Mount 1 x DC adapter 1 x User manual. 1xSKS CABLE (RCA female connector). The item "Lilliput 7 619A HDMI Field Monitor+LP-E6 Plate+ Hood For Canon 5D-II III DSLR" is in sale since Saturday, March 8, 2014. 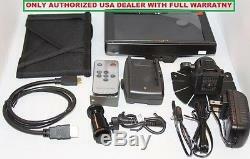 This item is in the category "Cameras & Photo\Video Production & Editing\Video Monitors". The seller is "carmate1" and is located in San Gabriel, California.